Current Market Analysis: National bank notes from the Midwest typically struggle to sell for the same prices as equally rare notes from western and southern states. The plethora of notes available from Chicago banks really brings the value of many other notes from Illinois down. There are still plenty of collectors looking to buy notes from the wealthy suburbs in Chicagoland. Even Illinois banks in the St. Louis metro area have a close following. However, don’t expect rare notes from small farming communities to be worth tremendous amounts of money. They just don’t have a following amongst the people in the hobby who are paying up for interesting notes. The supply tends to outweigh the demand in today’s market. 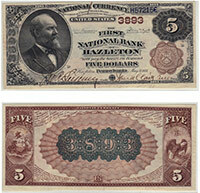 We buy all antique paper money issued by The Will County National Bank of Joliet, IL. We can tell you how much your $5 bill is worth. We aren’t just dealers. We are also collectors, experts, and appraisers. We have contributed to numerous price guides and are considered specialists in the field of national currency. Contact us via phone or email to get your free appraisal today.